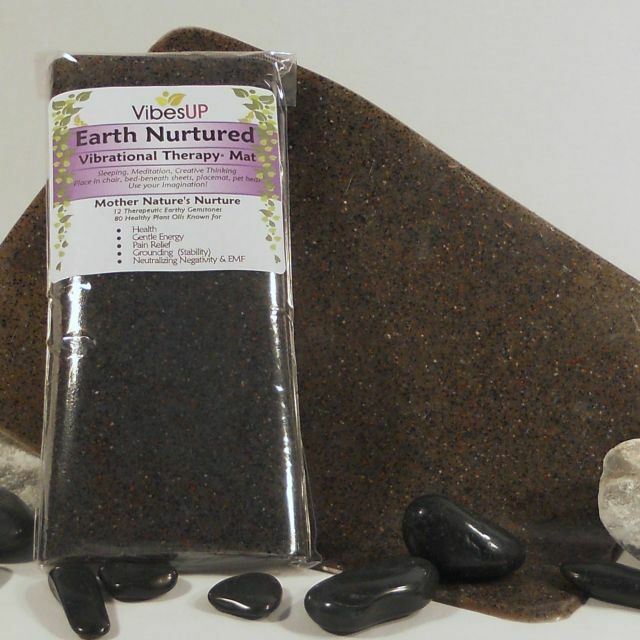 Zeolite is known to amplify Black Tourmaline awesome abilities by 40x and is known for detoxing the body of heavy metals and mycotoxins, balancing pH, trap/remove pre-viral components, balance immune system, is a potent antioxidant and has been said to aid in the prevention of major health challenges. UNIQUE DELIVERY of EARTH ENERGY- Alive with waves of therapeutic nature energy... With a unique natural delivery system that pulses out gentle infrared rays of natural piezo-electric energy delivering the healthy vibrations of essential plant oils, therapeutic gemstones and liquid quartz crystal in a powerful and deep nurturing delivery beneficial to body mind and soul. Grounding, Ionizing, Vibration Raising & Earth Nurturing- Vibrational Therapy Mats for bringing the balance of nature back into our modern lifestyles. Pulls out the non beneficial energies and feeds back nature's nurture. Grounding has been shown to also help with pain relief, hormone balancing, inflammation and MUCH more. For sleep, sitting, sork, school, car, homework, placemats and much more (see article with suggestions below). Mats contain over 80 essential plant oils plus liquid crystal & Gems of Clear Quartz, Black Tourmaline Rose Quartz, Amethyst, Carnelian, Red Jasper, Banded Agate, Labradorite, Peridot, Smoky Quartz, Sunstone, Prenite, Dalmatian Jasper, Fancy Jasper, Selenite, Rutilated Quartz, Mookite, Blue Lace Agate, Moss Agate, Green Aventurine, Tigers eye, Rhodocrosite, Lapis, Sodalite, Picture Jasper, Obicular Jasper. Put on smart meter to help neutralize(works GREAT!) muscle test before and after.